On the 12th July 2013, the Department of Energy and Climate Change published the final policy for the Domestic Renewable Heat Incentive. The scheme will open for applications in the Spring of 2014. 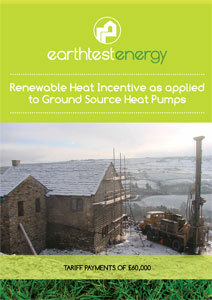 The tariff payments for ground source heatpumps will be 18.8 pence for each kilowatt hour of renewable heat generated. The scheme will pay out for seven years. Existing residential properties and new self build properties will be eligible. Second houses and holiday homes will be paid against metered heat outputs, whilst other properties will be paid against the deemed heat usage based upon an Energy Performance Certificate for the property. For existing properties, there will be a precondition that a Green Deal Assessment is undertaken and insulation levels in the roof and the cavity walls are brought up to economic levels. Green Deal Loans will be available to assist with the expenditure. Systems which have been installed since July 2009 will be eligible, but must be registered by 22nd October 2013. The tariff payment for ground source heatpumps will be 18.8 pence per kilowatt hour of renewable heat generated, for a period of 7 years. The consumption will be calculated on a deemed basis, and will use the figure taken on the Energy Performance Certificate. The main difference from the Non Domestic scheme and all previous consultations is the payment is only for renewable heat; that is the electricity consumption of the heatpump and the borehole pump are deducted from the heat output generated. This further emphasises the importance of getting heat out of the ground at the highest possible temperature and delivering it into the house at the lowest possible temperature thus maximising heatpump efficiency and minimising electricity consumption. It is expected that Heat Emitter Guide produced by DECC and others will be used to estimate the electrical consumption of the system and thus the RHI Payments. To read full information please click here to download a pdf of our brochure.